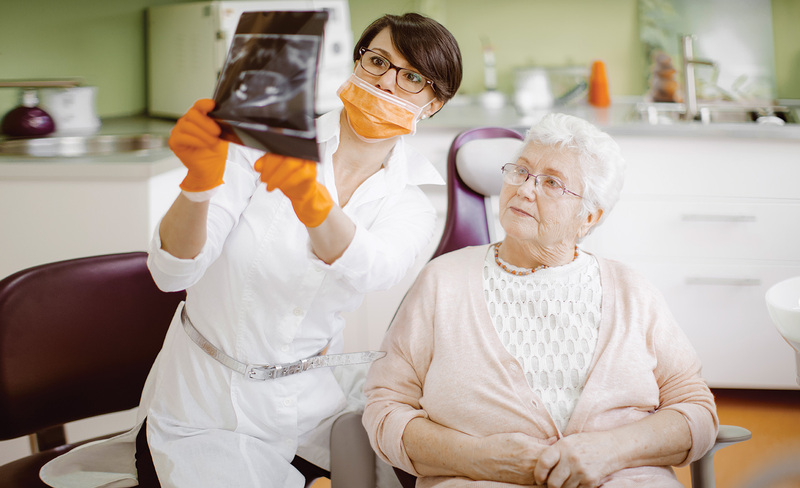 Oral Healthcare | We Stand With Seniors...Will You? In California, the population of older adults is growing twice as fast as the general population. On average, more than 1,000 baby boomers turn 65 every day. According to the Public Policy Institute of California, by 2030, as the Baby Boom generation reaches retirement age, California’s senior population will grow by four million people. Many seniors cannot afford dental care. Medicare, the primary health insurer for seniors, does not cover routine dental care. Although Medicaid coverage for dental care is available for low-income seniors in California through Denti-Cal, low reimbursement rates and administrative obstructions result in significant gaps in dental providers willing to participate. According to current data from the Department of Health Care Services, there are no Denti-Cal participating dentists in 13 of the state’s 58 counties, primarily in rural Northern California. In seven counties, there is only one participating dentist. In San Francisco, there are only 20 dentists and orthodontists to serve roughly 150,000 Medi-Cal enrollees. Medicare does not provide dental coverage. Low-income seniors may be eligible for Medicaid dental coverage. Medicaid adult dental coverage is optional and unstable. Where states do provide it, the coverage is subject to budget cuts. Being disabled, homebound or institutionalized also increases the risk of poor oral health. Why is Access to Oral Healthcare Important? Despite significant advances in dentistry and our ability to prevent many oral healthcare issues, dental disease remains a widespread problem for low-income seniors. Oral health has long been overlooked by our healthcare system, despite strong evidence that bad teeth and gums are linked to malnutrition, heart disease, breast cancer, cognitive decline, diabetes and stroke. Painful or absent teeth can also worsen social isolation and lead to depression. If improvements in access, affordability, education and awareness do not occur, oral disease and related health issues will become an increasingly prevalent and costly public health issue for our aging population – an issue that is only exacerbated by the rapid growth in California’s senior population. West Health is a family of nonprofit organizations established by philanthropists Gary and Mary West focused on healthcare research, policy and philanthropy to improve the lives and health of seniors. Addressing the critical need for improved oral healthcare for vulnerable seniors in California, the Wests established the Gary and Mary West Senior Dental Center (GMWSDC), a nonprofit, integrated community dental center dedicated to serving low-income seniors in downtown San Diego. Established in 2016, the GMWSDC links high-quality and affordable oral healthcare with a suite of nutrition, case management and wellness services offered through Serving Seniors’ Gary and Mary West Senior Wellness Center, creating a one-of-a-kind, integrated community-based system of care for older adults. At the end of 2017, the GMWSDC had treated 673 patients since opening, many of whom had complex conditions, resulting in a total of more than 4,900 appointments. Advocate for some of the revenue from California’s Proposition 56 tobacco tax initiative, which passed in November 2016, to be committed to improving oral health access for our seniors by supporting Denti-Cal improvements and increased payments to Denti-Cal providers in future budgets. Advocate for policies that improve access for Denti-Cal beneficiaries by providing supplementary payments to providers who treat a large number of Denti-Cal patients. Denti-Cal’s low payments mean these dentists often encounter financial difficulty when serving existing patients and are hesitant to commit to new program patients. Advocate for policies that improve access to critical dental services for Denti-Cal patients with other health conditions that complicate their dental treatments. This could include providing supplemental payments to providers that reflect the additional costs of these patients’ treatments. 1 CDC Fact Sheet on Oral Health for Older Americans, citing Dye BA, Thornton-Evans G, Xianfen L, Iafolla TJ. Dental Caries and Tooth Loss in the United States, 2011-2012. NCHS Data Brief, no. 197. Hyattesville, MD: National Center for Health Statistics; 2015. 2 CDC Fact Sheet on Oral Health for Older Americans, citing Eke PI, Dye BA, Wei L, et al. Update on prevalence of periodontitis in adults in the United States: NHANES 2009 to 2012. J of Periodontology. 2015;86(5):611-622. 3 CDC Fact Sheet on Oral Health for Older Americans, citing Dye BA, Thornton-Evans G, Xianfen L, Iafolla TJ. Dental Caries and Tooth Loss in the United States, 2011-2012. NCHS Data Brief, no. 197. Hyattesville, MD: National Center for Health Statistics; 2015. 4 CDC Fact Sheet on Oral Health for Older Americans, citing National Cancer Institute. Surveillance, Epidemiology, and End Results (SEER) Program. (N.D.) SEER Stat Fact Sheets: Oral Cavity and Pharynx Cancer website. http://seer.cancer.gov/statfacts/html/oralcav.html. Accessed July 5, 2016. 5 CDC Fact Sheet on Oral Health for Older Americans, citing National Institute of Dental and Craniofacial Research. National Institutes of Health. Fact Sheet: Dry Mouth (Xerostomia) website. http://www.nidcr.nih.gov/OralHealth/Topics/DryMouth. Accessed July 5, 2016. 6 iaojing L, Kolltveit J, Tronstad L, Olsen I. Systemic Diseases Caused by Oral Infection. Clinical Microbiology Reviews. 2000 Oct; 13(4): 547-558. https://www.ncbi.nlm.nih.gov/pmc/articles/PMC88948. 7 Griffin SO, Jones JA, Brunson D, Griffin PM, Bailey WD. Burden of oral disease among older adults and implications for public health priorities. Am J Public Health. 2012:102(3):411-418. 8 California Dental Association: Quick reference guide, more details on Denti-Cal adult benefit restoration in 2018. Website.https://www.cda.org/news-events/quick-reference-guide-more-details-on-denti-cal-adult-benefit-restoration-in-2018. Accessed January 4, 2018. 9 Little Hoover Commission. Report #230: Fixing Denti-Cal. Website. http://www.lhc.ca.gov/report/fixing-denti-cal. Accessed April 2016.